Can a Bigger Booze Tax Reduce Disease, Crime? Alcohol abuse is the third leading cause of preventable death in the U.S., and it contributes to countless diseases, car crashes, injuries, and crimes. How can we solve these thorny problems? Making booze more expensive might be a good start, a new study suggests. THURSDAY, September 23 (Health.com) — Alcohol abuse is the third leading cause of preventable death in the U.S., and it contributes to countless diseases, car crashes, injuries, and crimes. How can we solve these thorny problems? Making booze more expensive might be a good start, a new study suggests. Doubling the current state taxes on alcohol—which would tack on as much as 50 cents to the price of the average six-pack or bottle of wine—could be expected to reduce alcohol-related deaths by 35%, fatal car crashes by 11%, and the rates of sexually transmitted disease by 6%, according to the study. Higher taxes on booze would also lead to 2% less violence and 1.4% less crime, the researchers estimate. "What is surprising is the consistency of the effect across a broad range of health outcomes that kind of don't have anything to do with each other," says Alexander C. Wagenaar, PhD, the lead researcher and a professor of epidemiology and health outcomes at the University of Florida, in Gainesville. Though modest, these tax hikes would add up over time and may ultimately curb the heavy drinker who's seeing his weekly alcohol budget rise, the college student stockpiling booze for a party, and even the social drinker. "Studies show that all these groups respond to price," Wagenaar says. Even a slight decrease in drinking could have a large impact on public health. If millions of people living in an area consumed half a drink less per week, on average, the small differences in alcohol intake—and intoxication—could lead to big drops in the area's overall injury and death rates, Wagenaar says. There is some evidence that raising taxes can reduce unhealthy behaviors, even for people who are addicts. Increased taxes on cigarettes and other tobacco products have been shown to reduce smoking rates and influence heavy smokers to cut back or quit. In the new study, which was published in the American Journal of Public Health, Wagenaar and his colleagues re-analyzed data from 50 studies that investigated the link between increases in alcohol taxes and the rates of drinking-related problems including death, diseases, car crashes, STDs, violence, crime, and suicide. Most of the studies, which were conducted between 1955 and 2004, looked at alcohol tax increases in American states. One of the studies—led by Wagenaar himself—focused on Alaska, one of the few states to have implemented substantial alcohol tax increases. The researchers found that the state's alcohol-related deaths dipped in 1983 and 2002, immediately following tax increases. The 1983 increase, which upped the tax on a bottle of beer from four to six cents, was associated with 23 fewer deaths—a 29% drop. 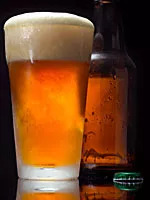 Alcohol abuse has been linked to an increased risk of liver disease, heart disease, stroke, depression, and some cancers, in addition to causing the impaired judgment that leads to risky sexual behavior and drunk driving. Sara Markowitz, PhD, an associate professor of economics at Emory University, says that even small increases in the price of alcohol are likely to result in measurable gains in public health and safety. Some health problems are likely to respond more than others to a tax increase, depending on how closely linked they are to alcohol abuse. "The proportion of crime and suicide that are alcohol-related would be far smaller than diseases such as liver cirrhosis," says Markowitz, who has researched alcohol taxes but was not involved in the new study. Indeed, the only health measure in Wagenaar's analysis that did not show a significant drop following higher alcohol taxes was suicide. Higher taxes on alcohol could provide a much-needed source of revenue for state and local governments reeling from budget shortfalls and cost-cutting. But the willingness of elected officials to increase the tax on alcohol is questionable, says David Jernigan, PhD, an associate professor and alcohol policy expert at the Johns Hopkins School of Public Health. Alcohol tax increases have lagged behind the inflation rate since the 1950s, which Jernigan attributes to the nation's anti-tax climate. There have been very few federal and state alcohol tax hikes in the past several decades, he says, and states like California and Maryland that have proposed increases have faced opposition from the restaurant and beverage industries. What's more, a proposed tax increase during a sluggish economy would almost certainly be unpopular among drinkers, including those who limit their intake to the occasional glass of white wine and those who'd never dream of getting behind the wheel after drinking. But boosting the tax on alcohol would be a "win-win for government" by increasing revenue and decreasing costs, Jernigan says. In Maryland, Jernigan has estimated, a 10-cent-per-drink tax increase would save the state $214 million in healthcare costs and generate $249 million in revenues, in addition to reducing alcohol consumption by 5%. "In terms of the analysis we did, there's nothing that makes Maryland stand out from other states," Jernigan says.